FormSmarts allows you to personalize the confirmation message that is displayed after a form has been submitted successfully. 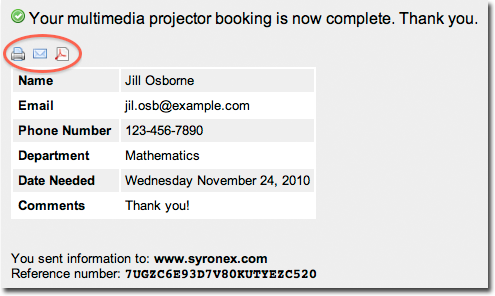 To personalize the confirmation message of a form, visit the Forms tab of the form builder, and click the Edit icon. This feature is only available for Pro and Business accounts. Like all messages shown during the form submission process, the default confirmation message is localized. If you change the confirmation message, users will see your personalized message instead of the default confirmation message in their own language. You can always revert to the default confirmation message by erasing the text in the Personalized Message box. You may insert links in the confirmation message and add basic formatting with this wiki-like syntax. Posted on Apr 11th, 2009 in form builder. Why Does Submitting a Form Require Two Steps? 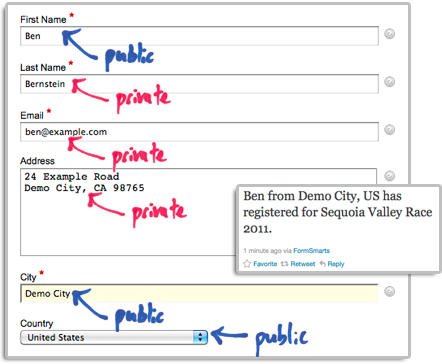 Many form processors let visitors submit a form in only one step: users fill in the form, and are done after pressing the submit button. With FormSmarts, there is an extra confirmation step, during which users are invited to review and confirm the information submitted. There are two strong reasons why we added the confirmation step. The first reason is quality. FormSmarts is typically used for transaction where the information submitted is important. Important because the information collected is intended to be read by humans, rather than machines. Important because this information is often intended to be acted upon. By allowing users to review and modify their submission, we increase the accuracy of the information you get in the end. Form users understand that, and it increases their confidence that you value the information they are sending you. Most of times, confirmation will only add a few seconds to the whole transaction. The second reason is security and usability. Many form submissions are automated, or even manual spamming attempts, known as form spam or comment spam. When a user presses the submit button, a lot more happens on the server than you may suspect. If we spot a likely spamming attempt, we’ll ask the user to complete one or more tests (e.g. CAPTCHA test) on the confirmation page. But in the same time, the bulk of users will never be asked to waste time on a CAPTCHA test. Based on years of experience, we have no evidence of users thinking they are done after the first step and not completing the form submission. Posted on Apr 23rd, 2008 in form handler. We often get questions asking whether FormSmarts web forms are protected against automated submissions by a CAPTCHA. A CAPTCHA is a challenge-response test used to determine whether the user is human. Yes, we do use CAPTCHA tests, but not every time a form is submitted. Instead, the form handler decides each time whether or not to require a CAPTCHA test (and other verifications), based on unobtrusive analysis by our form spam blocker of the information submitted. This saves time to every one, and reduces form abandonment. Asking the user to complete a CAPTCHA test for every form submission affects form usability and accessibility. 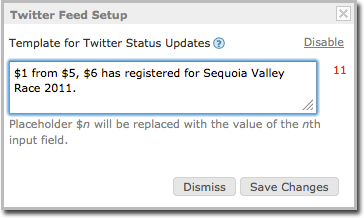 Posted on Jan 11th, 2008 in form builder, form spam. How Did Comment-Spammers Find My Blog? Did you ever wonder how comment spammers discovered your blog? One possibility is that the spammer sent out a bot to crawl the web from blog to blog. This requires some infrastructure, and is becoming less effective as more bloggers use some kind of comment spam protection mechanism. searching for all the pages with the phrase post a comment, but without the terms sign in, register, log in, etc. And as an additional benefit, blogs come already sorted by “importance” in the seach results. Extending the query to restrict results to blogs not using Captchas is left as an exercise to the reader. 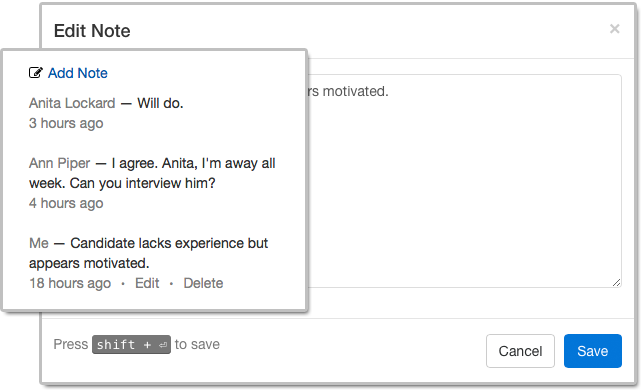 Avoid standard phrases like post a comment on your blog. More creative phrases like Reply to this Post, share your views or letters to the editor may be safer. Posted on Dec 12th, 2007 in form spam.